Ultra low friction disposable slider sheets, utilized for injury prevention when repositioning. MaxiOnce is a single use disposable sliding aid designed to meet the needs and challenges of hospital areas with high patient turnover and high demand on infection control. It is a tubular sliding aid made of a strong low-friction material. Quality patient care is key – the same MaxiOnce is only used with one specific patient on one occasion, ensuring a hygienic and secure patient transfer. MaxiOnce comes on a roll, which is inserted into the MaxiOnce holder. The MaxiOnce can be cut to any length which means it can be tailor-made to fit the patient and ensure minimum waste. The MaxiOnce measurement system makes it easy to determine the right length of the sliding aid. Between each ArjoHuntleigh logo, the distance is approximately 12 inches / 1 foot / 30 cm. 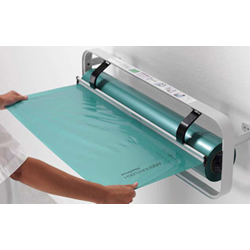 For nursing and care staff, MaxiOnce is always available – no more wasted time looking for sliding aids. No more sliding aids will be damaged or lost during the laundry process. Most importantly, no more dangerous manual transfers because sliding aids are damaged or unavailable. As single use disposables, MaxiOnce further protects against the risks associated with cross-contamination. Protecting patients is a key part of an infection control policy. Cost Management is high on the agenda for today’s healthcare managers. MaxiOnce can help to provide safer patient transfers and reduce the risk of injuries to caregivers. The Roll Holder is also available, check-mark below.